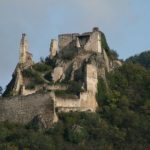 On a rocky hill above the Austrian mediaeval town of Dürnstein on the River Danube is the crumbling ruin of a castle. A castle where pages of history and a romantic legend are entwined. The castle where Richard the Lionheart was imprisoned on his way home from the Third Crusade in the twelfth century. 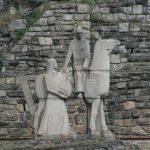 Legend has it that no-one in England knew which castle their King had been imprisoned in, and so his faithful minstrel, Blondel,set out to find him, travelling from castle to castle across Europe playing his lute and singing a song he and his master enjoyed. When he reached Castle Dürnstein he sat by the wall that night and sang the first verse of the song. To his immense joy the second verse, known only to him and the King, floated up from the castle dungeon enabling Blondel to notify Richard’s mother, Queen Eleanor of Aquitaine, and Richard’s supporters, of his whereabouts. The legend so impressed Charlotte Brontë she wrote a poem, Richard Coeur de Lion and Blondel when she was 17, now in possession of the British Library. Today Dürnstein not only trades on the one-time presence of King Richard 1 of England, it is also known for its wine and apricots. Terraces of apricot trees rise towards the old castle, while geometric patterns of vineyards spread in all directions. It was summer, apricot season, when we walked alongside the Danube by the sky-blue and white Abbey. A tunnel led us through a thick stone wall to stairs up to the cobbled main street. Clearly the town catered to tourists but without the kitsch so often present in other places. Shopkeepers invited us to sip their apricot schnapps or taste their brandied apricots, while a slice of apricot strudel in a Konditorei was a must. 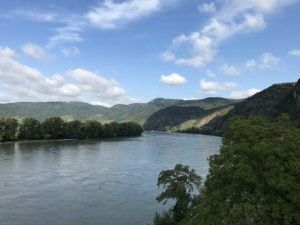 As we ate, the Danube flowed below us through the peaceful, rural landscape, past a sculpture of Richard the Lionheart and Blondel on its bank. What a beautiful post, Diana. Makes me want to go there. A delightful piece Diana. 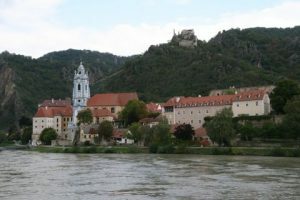 It brought back memories of a lovely day we had in Durnstein. We were told about Richard being imprisoned in the castle but not the legend — which gives it a magical quality.